Today waterjet is one of the fastest growing machine tool processes in the world and has over 30,000 systems installed. But how did it begin? I’ve seen many different claims over the years as to the start of waterjet. There is only one thread – one sequence of events – that I subscribe to, and that is the specific sequence that leads to the commercialization of waterjet for the cutting of soft materials in the 70’s. It starts with a forestry engineer in the 1950’s, a man I had the pleasure of meeting many years ago. Pure waterjet was invented by Dr. Norman Franz as he looked for alternative ways of cutting lumber. First, he proved that pressurized water could create a supersonic stream that in short bursts could cut wood. To create a continuous stream he needed a high pressure pump. He settled on a polymer injection pump manufactured by McCartney. Eventually in the 1970’s the waterjet was commercialized using the intensifier pumps. In the early days of waterjets, there was no abrasive included – just plain water. The supersonic, hair-thin stream cut corrugated cardboard, fiberglass home insulation, tissue paper, disposable diapers, food, automotive interiors, gasket, foam, and other soft materials. Demands from the automotive and diaper industry pushed waterjet pumps to become more and more reliable to meet their 24/7 production requirements. Industry’s constant need for faster production pushed pressures up as well. But there was always a hard ceiling to what the pure waterjet could do. Water alone can’t effectively cut through metals, stone, glass, or other hard materials. Enter Dr. Mohamed Hashish and his team in the 1970’s. As a young scientist who had dedicated his talent to waterjet, Dr. Hashish had been working on ways to increase the cutting power of a pure waterjet. His team tried many approaches and eventually came to find cutting power would be best increased by creating an abrasive entrainment jet – a sand blaster on steroids. In simple terms, a mixing chamber is added to the pure waterjet cutting head where abrasive is metering in. Within this cutting head the water and abrasive (and some air) exit out together through the 2 to 4 inch mixing tube (50 to 100 mm). The abrasivejet is actually very simple and elegant in design concept– the best designs always are. Adding these tiny grains of sand made all the difference. This was the change that was needed. The resulting abrasive waterjet stream increased the cutting power of the pure waterjet a thousand times. Now thick metal, glass, stone, tile, composite – almost anything up to and slightly beyond alumina ceramic – could be cut with the new system. In 1984 the first commercial systems became available. Mohamed and the industry settled on garnet as the best abrasive for cut speed, component wear life, and operating cost. Garnet is the abrasive of choice used in nearly all systems today. You might be wondering, why didn’t Flow and Mohamed patent abrasive waterjet? We did. Unfortunately two things happened. After the patent was in process the management lost interest in defending a technology with unknown potential, and a full set of drawings were leaked to a competitor. Any exclusivity was lost. In hindsight, this was the best thing that could have happened. The waterjet industry was so small back then that the technology needed more than one champion to get the word out and add credibility. Today the pure waterjet is used to cut soft materials and also to remove coatings such as paint off ships. The abrasive waterjet is used to cut metals up to 12 inches thick (300 mm), as well as stone, glass, composites and ceramics. For the past 15 years the waterjet process is considered one of the fastest growing major machine tool processes in the world. 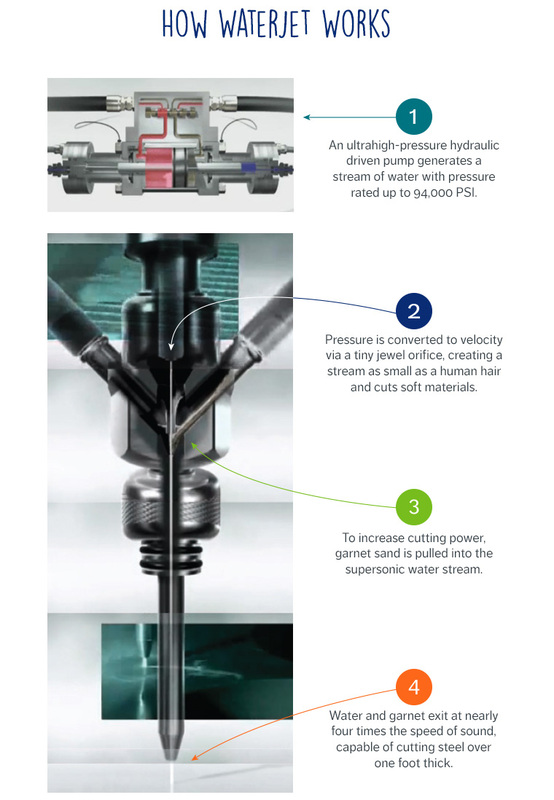 The technology continues to improve as pressures increase (improving efficiency and cut speed) and we find new applications. Please send me your comments on this post or suggestions for future topics. You're already subscribed to the FlowBlog. Thanks for staying up-to-date with us. Working with Dr. Hashish is really cool and it’s great that we can still benefit from his experience. I totally agree. You can’t develop anything in waterjet that isn’t built off the body of work Mohamed has created, and still creates today. I met him in grad school at an international waterjet conference in the ‘80s where he and I were presenting: I was nervous, he was gracious, and I’ll never forget it. As a subscriber, you've already chosen to stay up-to-date with our blog. And for that, we are thankful.